France, 1849 to 1878 Mint and Used Early Classics, over 50 items all identified, a useful group, some light dupl., high cat. value, generally Fine to Very Fine. France, Extensive Colonies Mint Stationery Stock, 2,671, priced and sleeved, large majority classic Peace & Commerce design, starting with Offices, and incl. General issues and all classic Colonies, identified by Higgins & Gage numbers, strength in New Caledonia (244-$2,294), St. Pierre et Miquelon (206-$2,553), Tunisia (266-$3,206), French India (113-$1,701), Guadeloupe (155-$1,970), etc., priced and sleeved, minor dupl, very little recent, mostly $5-$25 range, clean, total retail $30,782. Ex. Friedman "Cover Corner" Stock. 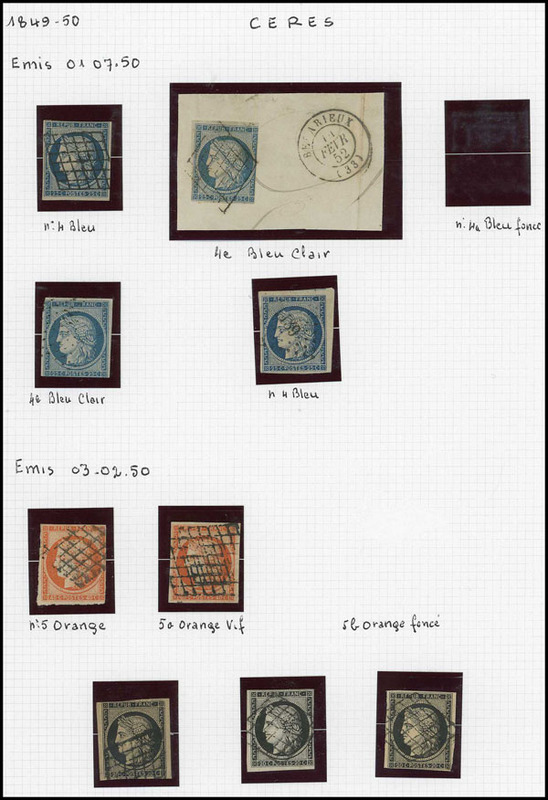 France, Mint and Used 19th Century Collection, on homemade pages in French, more used than mint, with many shades and types identified, vast majority of imperfs 4 margins, generally Fine to Very Fine. 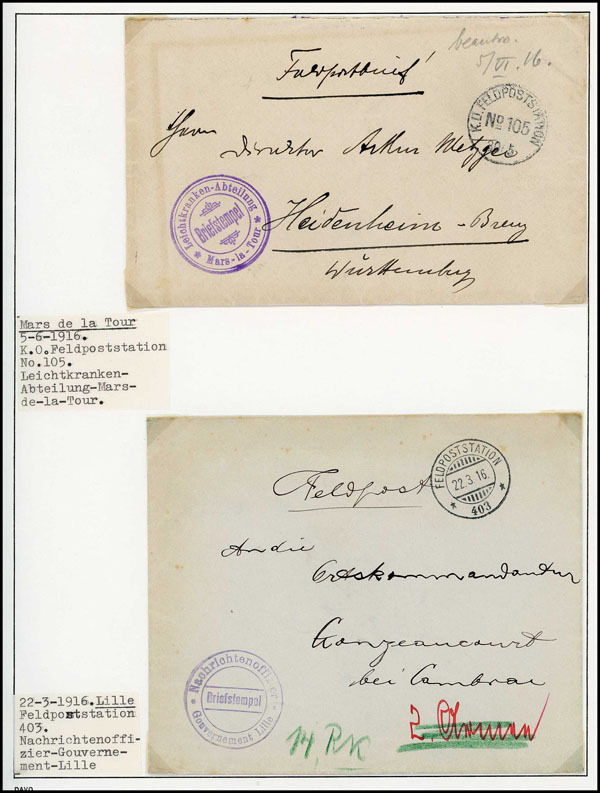 France, WWI Related Military Cards and Covers, two albums containing French military cards and covers with various cancels and markings, a wide and diverse accumulation from different regions incl. Prisoner of war cards, few other countries, inspection invited, generally Fine to Very Fine. France, 1849 to 2000 Collection, in 6 KaBe albums with Back-of-the-Book mixed in by date, mostly used to about 1925 with a few covers, then mixed o.g., n.h. or used to 1960, appears to be all n.h. from 1960 on, nearly complete from 1932 on, noted #9 used, 21 used (faults), 48 used, 197 o.g., 246 o.g., Airs with C1 used (all with A.P.S. certs), 329 l.h., C14 and C15 used, 19th Century usual mixed condition, 20th mostly fine to very fine. France, Mint Extensive Stationery Stock, 790 mostly classic incl. Peace & Commerce, identified by Higgins & Gage and/or Michel numbers, priced and sleeved, minor dupl, incl. Formular, wrappers, postal reply, few modern Aerogrammes, etc., mostly $3-$10 range, clean, taped with retail total $11,273. Ex. Friedman "Cover Corner" Stock. France, Cover Stock, 300, vast majority pre-1950 commercial, many to Foreign destinations, priced to $55, mostly $10 to $30, total retail $6700, Fine to Very Fine. France, Extensive 1950's to 1980's FD Covers, hundreds in banker and Pittsburgh boxes, somewhat sorted, virtually no dupl. and all identified by Scott #, priced and sleeved, incl. sets, retail pricing up to $30+, very high retail, clean. Ex. Friedman "Cover Corner" Stock. France, Colonies Cover Stock, 200, vast majority commercial 20th Century, good spread of countries, priced to $55, mostly $10 to $20, total retail $4600, Fine to Very Fine. France, Colonies Mint and Used Collection, housed in nine stockbooks, generally 19th and early 20th Century range, incl. Indo-China, Morocco, New Caledonia, Niger, Levant, Tangier, Port Said, Guinea, French Sudan, French Polynesia, Reunion, Senegal, Upper Volta, Chad, Djibouti, St. Pierre et Miquelon, Tunisia, Algeria, Guadeloupe, Somalia, plus a scattering of other non Colony countries, mostly Fine to Very Fine. France, Colonies, Early 20th Century Mint Stock, mostly n.h. in identified envelopes, some dupl., a useful group, mostly Fine to Very Fine. France, 1925 to 1993 Precancel Plus Modern Booklet Collection, #707/2371, o.g. to n.h., useful selection of precancels, booklets range from 1970's to 1980's, noted 1955 and 1969 Red Cross, generally Fine to Very Fine. France, Colonies Collection to 1970's, mostly o.g. in 2 Minkus albums, incl. French Equatorial Africa, Polynesia, Comores, and Mauritania, etc., well represented, generally Fine to Very Fine. 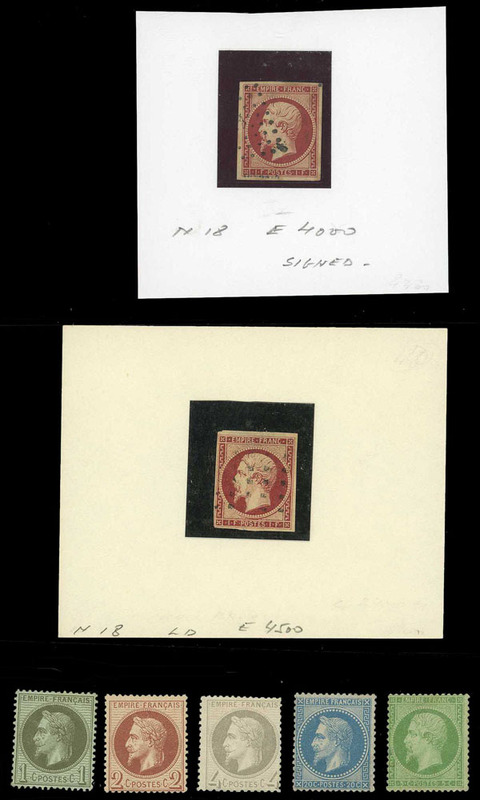 France, Precancel Accumulation, o.g., few hundred somewhat disorganized on stockpages with dupl., mostly Sower design, needs some sorting, Fine to Very Fine overall. 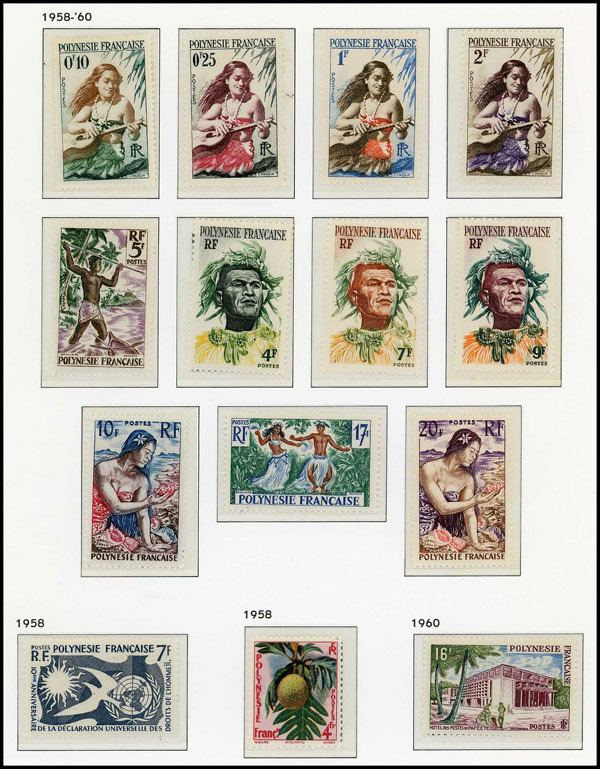 French Polynesia, 1958 to 2004 Collection, n.h. (couple l.h.) complete in Davo hingeless album, incl. only missing a few modern items for completion, incl. Airs and Dues and most souvenir sheets, clean lot, Very Fine.